The Moon has moved to Philadelphia. The citizens of Philly are incredibly stoked about their new celebrity resident. But before too long, things get a little wobbly in the city. The lunar proximity starts throwing people off in big ways. A local writer suddenly finds that she can't leave her house after nightfall due to crippling attacks of fear, anxiety, and depression. A local songwriter suffers from the same symptoms, but during the daytime. The Moon attempts to put things right. She sets up these two poor souls in the hope that they might help each other through their plight. But just when things seem to be going well, The Moon's ex - A Lunar Eclipse - rolls into town to screw everything up. Philadelphia Nocturne is a chamber rock musical narrated by a rock band named Philadelphia. It is set in a bar, and uses the audience to help tell its story of love, depression, and the cosmos. 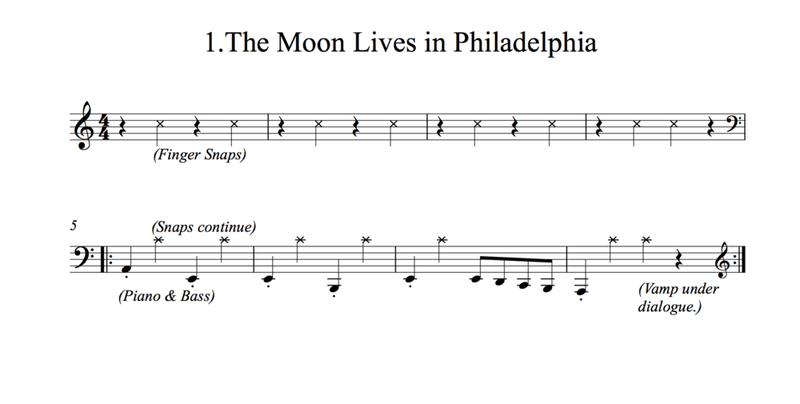 Philadelphia Nocturne was performed for the first time at FringeArts' La Peg bar in Philadelphia in January of 2017. It is currently being developed for a full production.